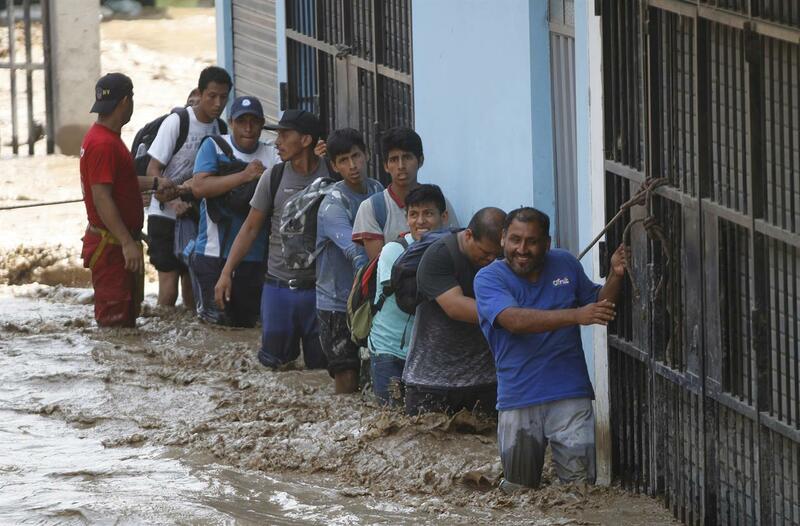 The number of people killed in Peru following intense rains and mudslides wreaking havoc around the Andean nation climbed to 67 Friday, with thousands more displaced from destroyed homes and others waiting on rooftops for rescue. Across the country overflowing rivers caused by El Nino rains damaged 115,000 homes, collapsed 117 bridges and paralyzed countless roadways. "We are confronting a serious climatic problem," President Pedro Pablo Kuczynski said in a statement broadcast live Friday afternoon. 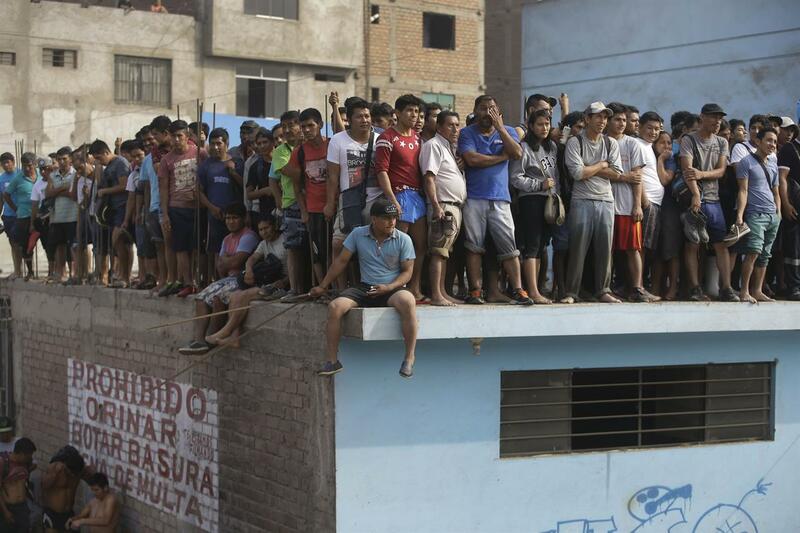 "There hasn't been an incident of this strength along the coast of Peru since 1998." The highly unusual rains follow a series of storms that have struck especially hard along Peru's northern coast, with voracious waters inundating hospitals and cemeteries, and leaving some small villages entirely isolated. 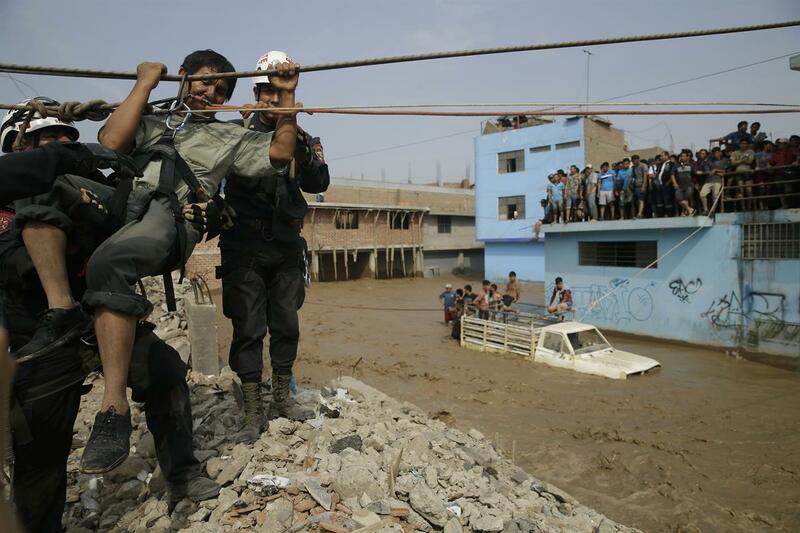 On Thursday, the National Police rescued eight people who had been trapped for three days in Cachipampa and removed the body of an 88-year-old man killed in the floods. In the highlands along the department of La Libertad, dramatic video showed crashing water inundating several buses and trucks, killing at least five people. Rescuers were searching Friday for survivors. 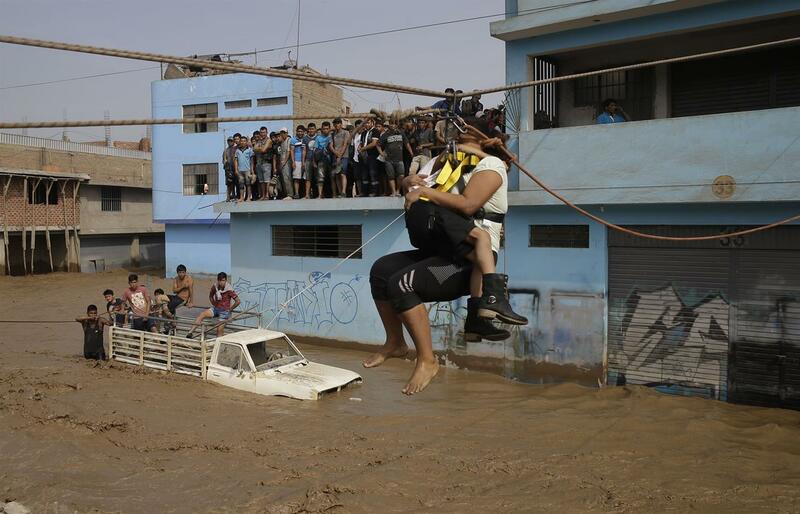 Even Peru's capital city of Lima, where a desert climate seldom leads to rain, police had to help hundreds of residents in an outskirt neighborhood cross a flooded road by sending them one-by-one along a rope through choppy waters. The muddy current channeled down the street after a major river overflowed. Some residents left their homes with just a single plastic bag carrying their belongings. In total, more than 65,000 people in nearby Huachipa were unable to either go to work or return to their properties. "There's no way to cross," said Henry Obando, who was rescued after leaving the factory where he works and making his way toward a rooftop where officers created a zip-line to cross. "Many people are trying to get to their homes." The storms are being caused by a warms of the surface waters in the Pacific Ocean and are expected to continue for another two weeks. Kuczynski declared Peru's Central Highway in a state of emergency Friday and announced he would be boosting funds for reconstruction. He said he was optimistic the country was in a strong position to make a swift recovery but urged residents to use caution. "This hasn't ended," he warned. "And it will continue for some time more." In 1998, another El Nino event brought heavy rainfall to the nation's coast, causing landslides, ripping apart homes and leaving hundreds dead. On Friday, drinking water was cut off throughout most of Lima, spiking the price for bottled water and creating long lines at city tanks. U.S. Embassy helicopters typically used to eradicate coca crops in the Amazon were redirected to help in rescue efforts. "People are desperate," said Doris Meza, who lives in one of the Lima districts most heavily inundated by the floods. "Water is entering everyone's homes. There aren't cars and drivers are charging whatever they want." A man is pulled to safety in a zipline harness in Lima, Peru, Friday, March 17, 2017. 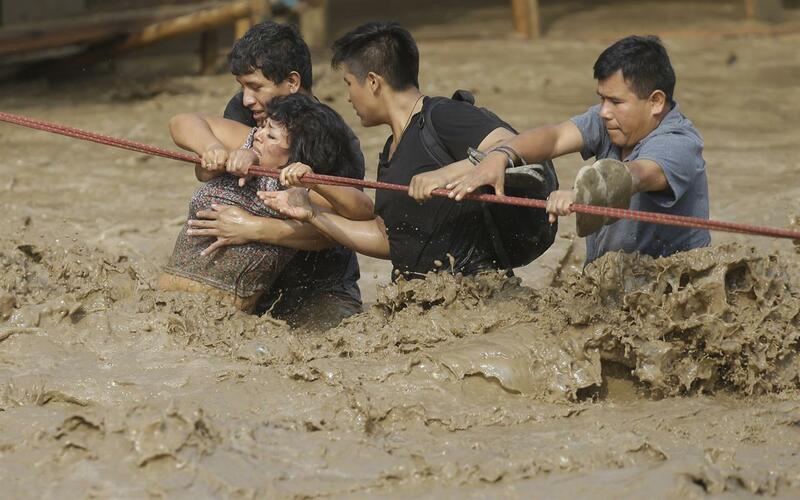 The number of people killed in Peru following intense rains and mudslides wreaking havoc around the Andean nation climbed to 67 Friday, with thousands more displaced from destroyed homes and others waiting on rooftops for rescue. A woman is pulled across flood waters in a zip line harness in Lima, Peru, Friday, March 17, 2017. Intense rains and mudslides over the past three days have wrought havoc around the Andean nation and caught residents in Lima, a desert city of 10 million where it almost never rains, by surprise. 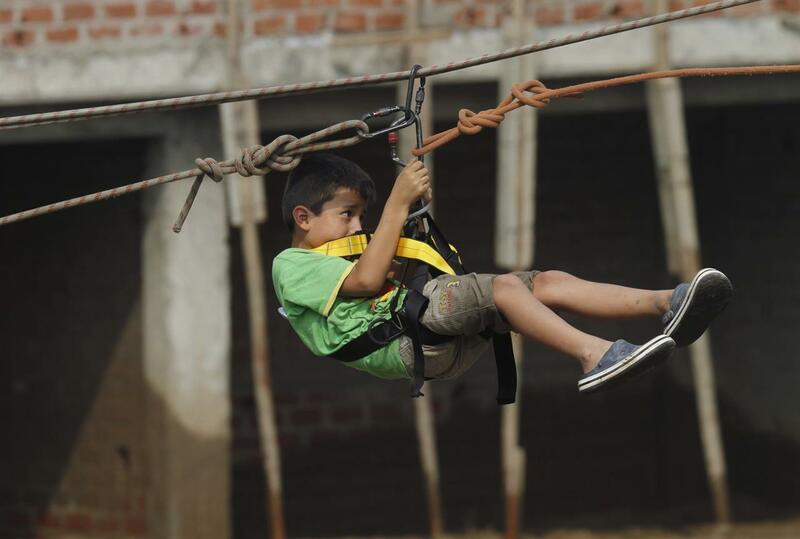 A boy, rescued from a rooftop, is pulled across flood waters in a zip line harness in Lima, Peru, Friday, March 17, 2017. 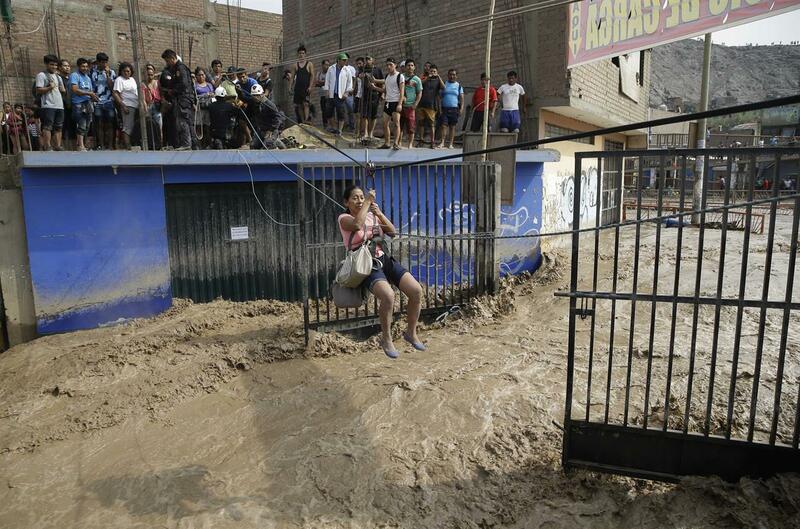 Intense rains and mudslides over the past three days have wrought havoc around the Andean nation and caught residents in Lima, a desert city of 10 million where it almost never rains, by surprise. A mother holds her daughter as they are pulled across flood waters in a zip line harness in Lima, Peru, Friday, March 17, 2017. Intense rains and mudslides over the past three days have wrought havoc around the Andean nation and caught residents in Lima, a desert city of 10 million where it almost never rains, by surprise. 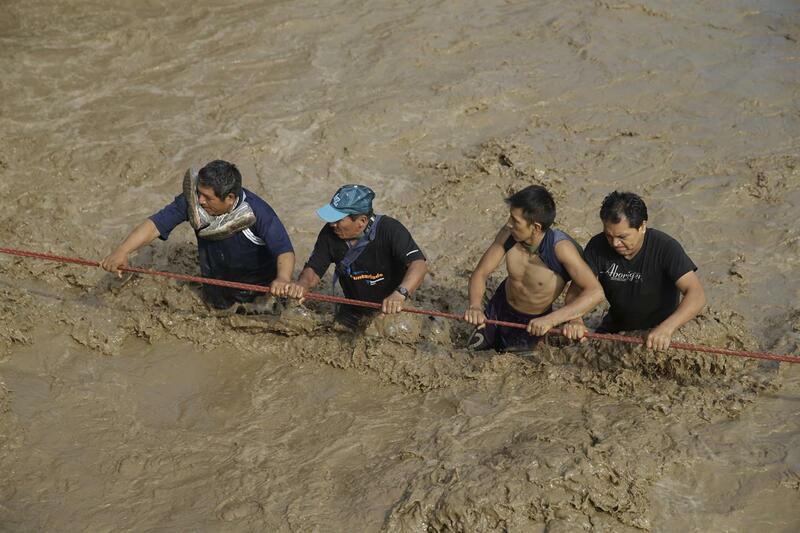 Men hold onto a rope as they wade through flood waters towards safety in Lima, Peru, Friday, March 17, 2017. Intense rains and mudslides over the past three days have wrought havoc around the Andean nation and caught residents in Lima, a desert city of 10 million where it almost never rains, by surprise. A woman is rescued from a rooftop in Lima, Peru, Friday, March 17, 2017. Intense rains and mudslides over the past three days have wrought havoc around the Andean nation and caught residents in Lima, a desert city of 10 million where it almost never rains, by surprise. 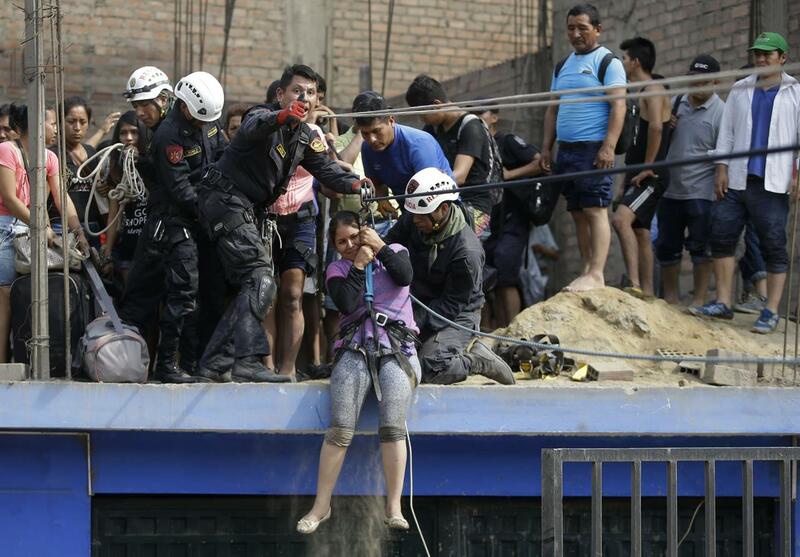 Rescue workers pull a man to safety in Lima, Peru, Friday, March 17, 2017. Intense rains and mudslides over the past three days have wrought havoc around the Andean nation and caught residents in Lima, a desert city of 10 million where it almost never rains, by surprise. 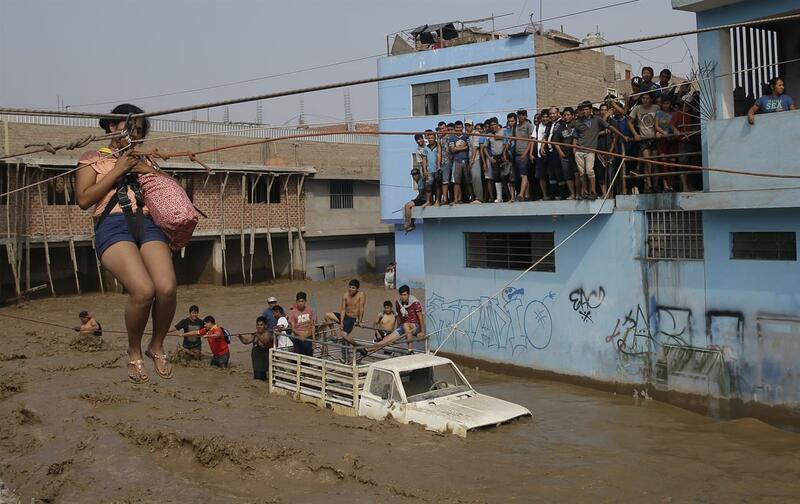 A group of people, stranded in flood waters, hold onto a rope as they walk to safety in Lima, Peru, Friday, March 17, 2017. 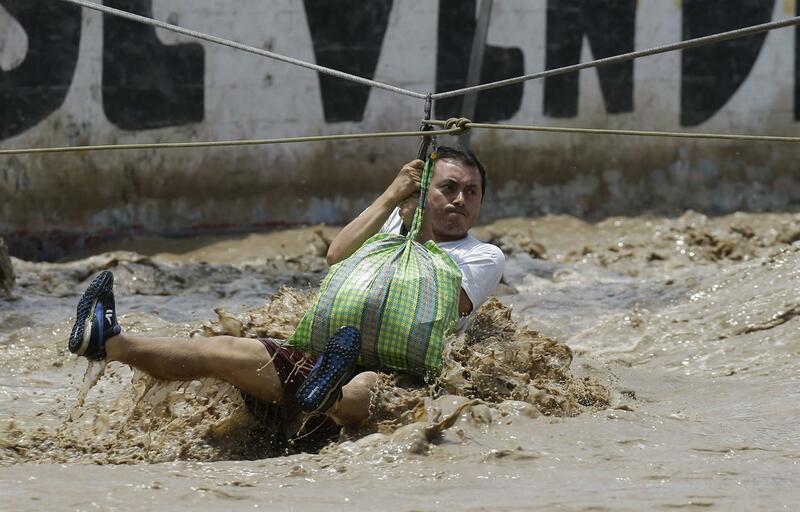 Intense rains and mudslides over the past three days have wrought havoc around the Andean nation and caught residents in Lima, a desert city of 10 million where it almost never rains, by surprise.